Clearwater grows a wide variety of high-quality native forbs (wildflowers), shrubs and grasses for landscaping and restoration projects. Please see our online catalog and availability list for plant species and container sizes that we offer, or feel free to contact us directly as inventory is always changing. Visitation to the nursery is by appointment only; please give us a call 541-350-5261 to schedule an appointment. Landscaping plants are readily available at our nursery and are grown primarily in 4-inch, 1-gallon and 2-gallon containers. Custom orders may be secured via contract. Plants for landscaping are mature with well-developed root systems. 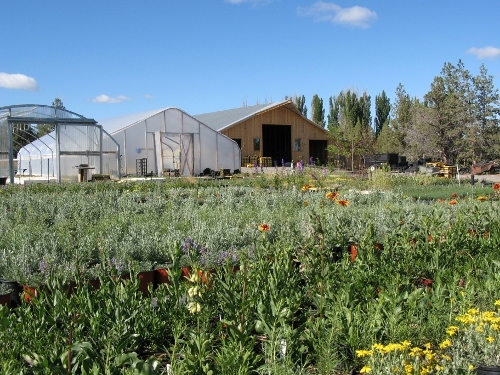 Many of our plants are drought tolerant and well-adapted to the high desert climate of central Oregon. Once established, native plants require less water and maintenance than ornamental plants used in landscaping. Grass, forb, riparian and wetland plugs are generally custom grown for restoration (or landscaping) projects; however, plugs may be available for immediate project needs. See our contract growing information to get started with your restoration project. © Clearwater Native Plant Nursery - All Rights Reserved.